This device is designed for making settings in additional devices that have no Bluetooth connection (Control point, smart control point, universal control point and so on). 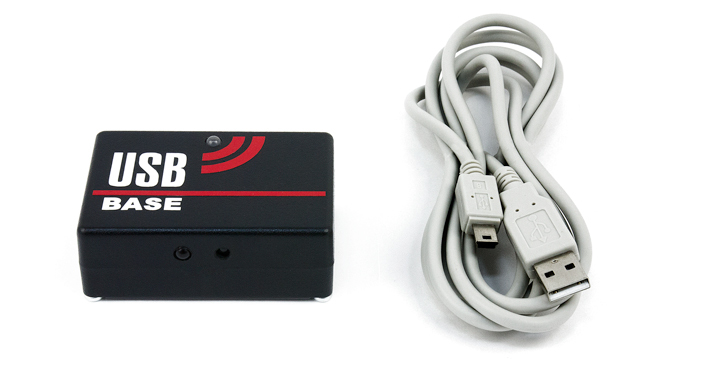 Its distinctive feature is using of USB interface for PC connection. It combines a small size, universal connection technology and has no need for built-in power supply source. One of the advantages is that the USB-cable or adapter can be purchased at any computer store. So, you can immediately connect your USB base to any computer (including a netbook or laptop). All you need is simply to connect the USB base to your computer via the USB cable, select and save your own settings and enjoy playing laser tag. Connect the USB base to a PC or laptop. Install the Laser Tag Configurator software. Drivers for USB-base will be installed automatically. Locate your laser tag device in front of the USB base as illustrated in the figure. 1. Turn on your device and wait. It should run in administration mode. You can check all preferences in laser tag configuator. 2. After making settings, click on the "Save" button.